On April 14, 2010, Gracie Margaret Lawton was born. She was the second child, so this time we had a planned c-section. This time no one waited in the waiting room; instead, they were busy keeping big brother occupied at home and waited anxiously for the news of Gracie’s arrival. At 12:30 in the afternoon, Gracie entered this world and made an everlasting imprint in the hearts of her mom and dad. Our families were notified that they had a new, healthy, beautiful baby girl to add to our family. We all quickly fell in love with our baby Gracie. Everything went smoothly, and we were now a happy family of four. Everything was perfect and stayed perfect during Gracie’s first year here with us. Gracie was a perfect, happy, healthy baby. She smiled and giggled a lot, especially when around her big brother. She hit all her developmental milestones at the appropriate time and was never sick. It was often that people would comment on her easy-going nature. This perfect picture came crashing down on us around Gracie’s first birthday. We noticed she wasn’t acting right. She seemed sad, wanted to sleep a lot, had frequent low-grade fevers, stopped walking and stopped playing. It seemed as if Gracie’s happy, playful, easy-going self was slipping away. As a mom, deep down I knew something wasn’t right, but there seemed to be an excuse for everything. She was cutting teeth, she was constipated, she caught a bug from her big brother… I found myself comparing her to her big brother at that age and knew something wasn’t quite right, but I have always been told how different siblings can be. We had taken her to the doctor’s for fevers, but there were no other signs or symptoms to lead us to the culprit of Gracie’s deteriorating personality, except those normal baby issues mentioned above. It was when we noticed her belly was getting bigger and harder that we knew something else had to be wrong. On May 5th, we took Gracie to the emergency room where they did an ultrasound and sent us to Albany Medical Center. We were scared, but the ultrasound results stated that it was most likely a cyst or infection; cancer was listed but at a percentage rate of 2%. When we arrived at Albany Med, we were bombarded by doctors who seemed puzzled at what this could be. By mid morning, the infectious disease doctor and the oncology doctor both came in. They explained it could be an infection in her liver or a tumor. We would be doing CT scans soon to find out. Even though they mentioned tumor, we dismissed that idea immediately. How could my sweet, happy, healthy baby have cancer? Gracie had her scans, and the team of doctors came in soon after. We both remember seeing the oncology doctor lead the way in and sit down with a computer. She was leading this discussion, yet we still didn’t think that the diagnosis was going to be cancer. We were wrong. She told us Gracie had tumors in her liver, belly and possibly lungs. She showed us the images of our baby’s belly. All we could see were very large, unwelcome masses taking over the inside of our daughter’s belly. Immediately we thought, Okay – what are we going to do? How do we get them out? What are her chances? We’ve all heard of stories of surviving cancer and have actually heard that so many cancers are now treatable. This was not going to be the case for Gracie. The doctor explained very calmly that the team suspected Gracie had neuroblastoma, the chances of survival are about 40%. We broke down crying; we couldn’t hear anymore of what she was saying. We were crushed; Our lives had changed just like that. Gracie was to have surgery the following day to biopsy the tumors and put a port into her chest. Surgery went very well, and it still looked like the diagnosis was euroblastoma. But pathology needed to confirm the diagnosis with more testing. Within the next few days, the pathologist confirmed that Gracie did not have neuroblastoma, but it instead looked to be hepatoblastoma. Immediately our chances of survival went from 40% to 70%! We were so excited and called to tell everyone the great news. Even though they believed she had hepatoblastoma, they still needed to send the slides to a specialist at a larger children’s hospital to confirm the diagnosis. As quickly as we were jumping for joy that Gracie’s chances to beat this cancer improved dramatically, it was taken away and instead we were crying. The test results confirmed that Gracie had a very rare and aggressive form of cancer called rhabdoid tumor. Her chance of survival was now 20%. By the time we had figured out the accurate diagnosis of rhabdoid tumor, Gracie had already started her chemotherapy treatments. She handled her chemotherapy treatments very well. We would often tell the doctor that we couldn’t believe that chemotherapy was bringing our daughter back to life! Gracie began smiling again, walking, playing and doing everything a one year old should be doing. We were thrilled and confident Gracie was going to beat this cancer. Even though the prognosis was so dismal, everybody involved with Gracie’s care thought maybe this was the girl that was going to prove everyone wrong. Gracie would go in for her chemo treatments on time and was discharged from the hospital as soon as they were finished. The chemo wasn’t slowing her down at all. She walked the halls of the hospital batting her blue eyes, blowing kisses, smiling, playing peek-a-boo, singing, dancing and clapping to her favorite music. She was so happy and playful. When the nurses came in, she always insisted on holding and keeping the syringes they used to clean her lines. We joked that she was going to be a doctor or nurse when she grew up! At home, Gracie was just as playful. She loved being home and loved being outside. She would toddle around the yard after her big brother, while mommy chased after her to keep her safe. From May to September Gracie received seven rounds of chemotherapy, three CT scans, a few blood transfusions and many weekly clinic visits. Everything was smooth sailing until we noticed she started slowing down a bit in September. Gracie continued to play with her brother but seemed to get tired easily. But more teeth were coming in. However, she wasn’t eating as much and was irritable, and a little area in her belly was sticking out a bit: The same symptoms that were presented in May were showing up again. We immediately called the doctor and went in for a clinic visit to check things out. The doctor felt her belly and immediately sent us down for an ultrasound. The results confirmed what we were all thinking. The tumors were growing again and had become resistant to the chemo drugs we were giving her. This is what everyone was afraid of; this is what rhabdoid tumors are famous for and why the survival rate is so low. Again, we were crushed and unsure of what to do. The doctor came in and said we have a few choices. We can let Gracie go, stop treatments and enjoy the few weeks we have left with her, or we can fight back harder. If we choose to fight back, the treatments were going to be very difficult on Gracie. She would most likely become very sick from the high-dose chemo, she will get infections and we will probably be spending a lot more time in the hospital, but it could work. As long as we still had choices, we felt as if we couldn’t give up on Gracie. She was fighting so hard, and she had a lot of fight to go. We still had options, and we were going to take them. Gracie began treatment and did ok. The chemo was wiping her out this time, but she still seemed to have a smile on her face. And she continued to bring joy to everyone around her. This time we were in the hospital for much longer, but Gracie made it through the first round with no infection and an ultrasound showed the tumors were shrinking again; but this time at a slower rate. We were excited the tumors were shrinking and decided to continue the high dose treatments. From that time, we had to live in the Ronald McDonald House. We were allowed to leave the hospital but had to stay close by in case she developed an infection. The Ronald McDonald House became our new home for the next four months. They welcomed us with open arms and made us feel at home. 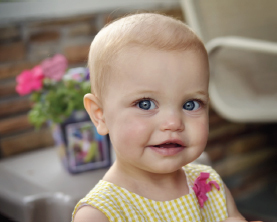 When Gracie was ready, she began her second high-dose treatment; this one resulted in an infection. We were so lucky to have not had any infections all summer long because infections are not pretty. Gracie was so sick. We were scared she wasn’t going to make it. We sat by her bedside while she had high fevers, moaned in pain and couldn’t move. We felt helpless. Within a few days, the antibiotics began working, and Gracie was on the mend. Gracie went through five more rounds of high-dose chemo after that, and each one resulted in an infection. Our little girl was disappearing before our eyes. A late November scan showed that the high-dose chemo was shrinking the tumor, but the shrinkage continued to be very little: The chemo was preventing the tumor from growing, but it wasn’t taking it away. From the beginning, the plan was to shrink the tumors with chemo, surgically remove what was left and end with more chemo. The problem was we could never get the tumors small enough to get her to surgery. At this point, we were just prolonging Gracie’s life, and in doing that, she was suffering. By this time, Gracie couldn’t walk, talk or play anymore. She was exhausted. She wanted her bunny and her mommy and daddy to hold her. At this time, the doctors told us that if we wanted to take our family to Disney World, now was the time. We did just that. When we came back, we gave the chemo one last try. We believe that chemo let us have our last Christmas with Gracie. We stopped the chemo treatments, prayed for a miracle, and enjoyed our daughter for her last few weeks here with us. On the morning of January 17th, Gracie became an angel. Each day is a struggle, and we miss her so much. We know that Gracie’s story touched so many lives and changed so many as well. We believe this was part of her gift to everyone. In honor of Gracie, we will continue to give gifts in her name.